There are numerous arguments as to why plastic is better – when thinking about it on a humanitarian level and, of course, business level – but we have seen that the casual usage and discarding of it has and is causing more problems to the environment than a glass bottle could. Jaci’s Lodges in the Madikwe Game Reserve, with whom Cheetah Plains shares affiliation, has already jumped at the chance to do their bit with recycling and limiting the use of plastic: by not using or purchasing drinking straws (a huge contributor to discarded plastic) and by switching to re-usable water bottles. 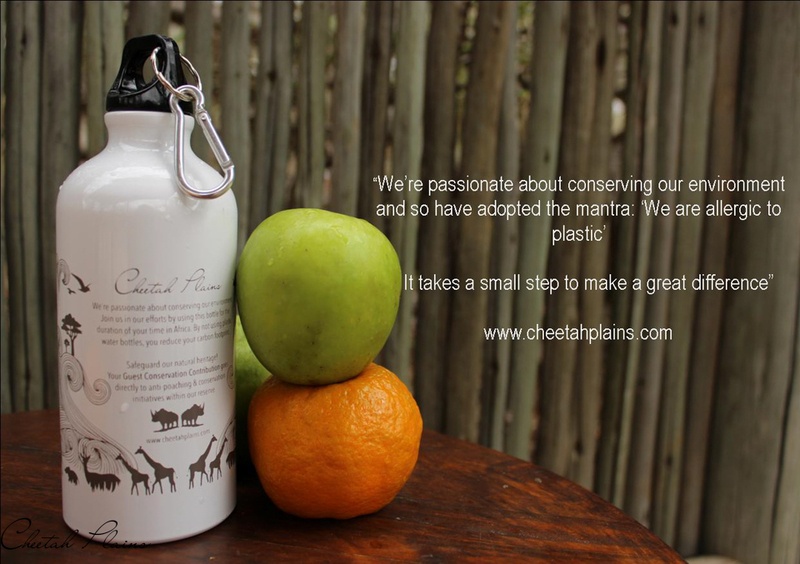 We at Cheetah Plains have joined this effort and have, like Jaci’s Lodges, adopted the mantra: “We are allergic to plastic”. 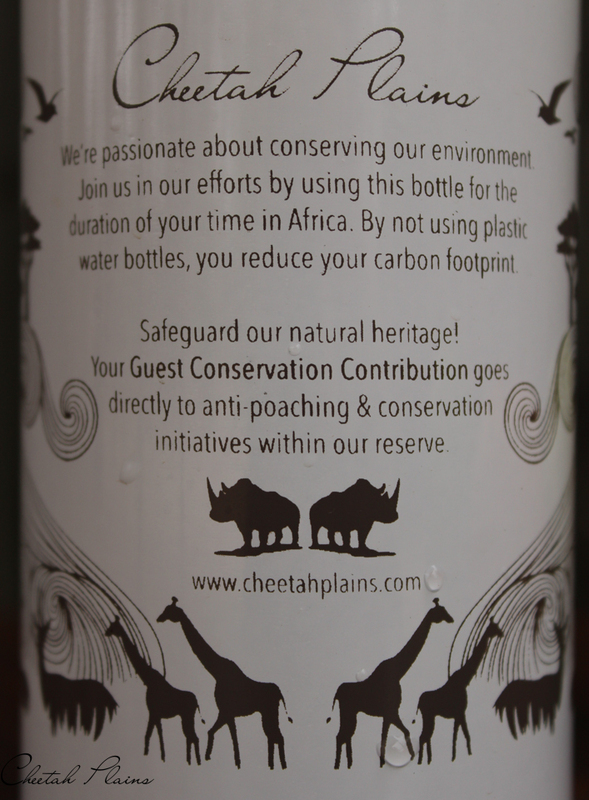 On arriving, guests are gifted each with a lovely, Cheetah Plains water bottle. These are made from a durable metal and so is guaranteed to last. But these are not only for use at the lodge. Guests are encouraged to take them with and use them throughout the rest of their holiday in South Africa; a fantastic, practical gift that not only saves a Rand or three, but also provides our visitors with something to ease their worries of needing to find a shop, or having to find a dustbin or just leaving an empty bottle on a bench or bus seat in hopes that someone will collect it and throw it away. It is a small step, but one that is definitely in the right direction, as it will limit and hopefully stop the purchasing of disposable water bottles. Although we have only just now joined this initiative, it has already been met with enthusiasm from our guests! On explaining why we have opted for this method, verbal comments such as “great idea!”, “that is wonderful!” and “yes, we need to protect our environment.” have been passed. 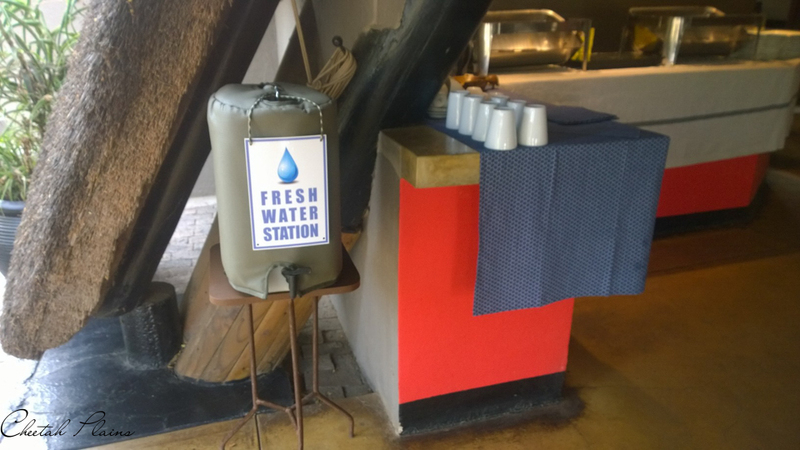 Refilling these bottles while staying at the lodge is a flawless task with there being three easy-to-find water stations: At the reception, at the bar and by the coffee station. The plight of plastic has increased greatly over the last couple of decades; with it being cheap to manufacture on a great scale and treated as the best solution for keeping up with the ever-increasing supply and demand, we are faced with a grand-scale problem: the “200-year” decomposition rate. Who doesn’t love the easiness of being able to just reach into the fridge and pull out a bottle of water whenever you need one? Also, with more of us being uneasy about the conditions of tap water – especially when travelling abroad – and being fed the idea that distilled, or “still”, water is of greater benefit to our health, it has helped with the over-mass-production of the plastic bottle. The reduction and eventual ceasing of the use of disposable plastic is an addition to a couple of other conservation methods we have adopted to responsibly reserve and recycle resources such as water and food wastage. If we don’t start to care for our planet, who will?